Parks’ photography was part of what his contemporary, black writer Richard Wright (Native Son) called “the new tide.” in using his photography as a “new mode of reporting” in the black civil rights movement Parks was the first African American photojournalist to be hired to shoot photo essays for Life Magazine, the gold standard of photojournalism in America. Born in Fort Scott, Kansas, in 1912, the youngest of 15 children, Parks got his first job was as a dining car worker on the railroad. When he saw magazines with photographs of migrant workers he was inspired enough to buy a camera at a pawn shop in Seattle, Washington. He got an assignment to shoot women’s clothing in St. Paul, and those photographs were noticed by Marva Louis, who was married to heavyweight boxing great Joe Louis. Mrs. Louis encouraged Parks and his family to move to Chicago and open a portrait studio. His stunning photo of Marva Louis is one of the most gorgeous photos in this volume. In addition to being a successful commercial photographer Parks was emerging as a photojournalist, chronicling life for African Americans in Chicago’s poverty stricken South Side; those photographs won a fellowship with the Farm Security Administration (FSA). This collection also has so many plates that are less famous but equally arresting: a calendar with a picture of FDR is blurred in the background of a portrait of an Asian man with a cigarette hanging out of his mouth and a small American flag on a mantel brushing his shoulder. Or images of crushing poverty, capturing a group of children in Puerto Rico, some of them naked, on the porch of a dilapidated house. Parks broke through with an equally successful commercial career as a fashion photographer for Vogue, Glamour, and Ebony. 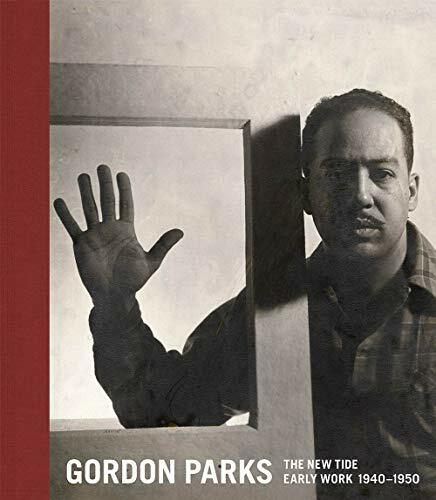 Parks was also a pivotal figure in a Black arts collective in Chicago during the ’40s, as editor-photographer for the black newspaper The Chicago Defender. The book is representative of Parks’ egalitarian template. His artistic lens took him everywhere in the country. From a group of white male drugstore cowboys hanging out looks right out a John Ford movie, to the streets of Stromboli, Italy, photographing of Swedish star Ingrid Bergman looking as gorgeously intriguing as ever. Fishing boats off of Gloucester, MA, to drugstore cowboys hanging out in a drilling town in Alberta, Canada. In the section Mass Media is a collection of juxtapositions of Gordon shooting haute couture of top fashion models on the streets of post-WWII Paris. Meanwhile, Parks also documented the crushing poverty and blight of urban landscapes in photos from The Home Front. A black boy on crutches standing in the doorway of a tenement, having lost his leg in a streetcar accident when he was playing in the street, a photo essay for Life had him staked out in the midst drug war in Harlem with gang members as it was happening. In 1943 Parks was in Michigan to document the final training of the first group of African American fight pilots—the 332 Fighter Group at Selfridge Field, Detroit—about to be deployed to Italy and Northern Africa. Parks was credentialed as a war correspondent/photojournalist by the Office of War Information (OWI) and slated to be embedded with them overseas. The Pentagon put a stop to it at the last minute; top brass didn’t want black pilots to be shown fighting the enemy; that would make them look courageous or heroic to the American public. Growing up, Parks was subjected to “names that arouse anger and humiliation. I was stoned and beaten. The indignities came so often that I soon began to accept them as normal. But I always fought back.” Parks used his camera, “as a weapon” a way to fight social injustice, racial oppression and American inequality against minorities. In addition to this stunning collection of Parks’ photography, featuring gorgeous plate transfers, the text explores the different aspects of Parks’ life and thoughtful analysis of his aesthetic and impact on photojournalism.